Make sure you give your crowdfunding campaign updates regularly. At the start of the campaign on Fueladream, you would have committed to a weekly or fortnightly or monthly update frequency. Stick to that schedule and do not miss feedback deadlines. It is important for you to post regular updates to your crowdfunding campaign to keep your funders up to date with the progress of your project. 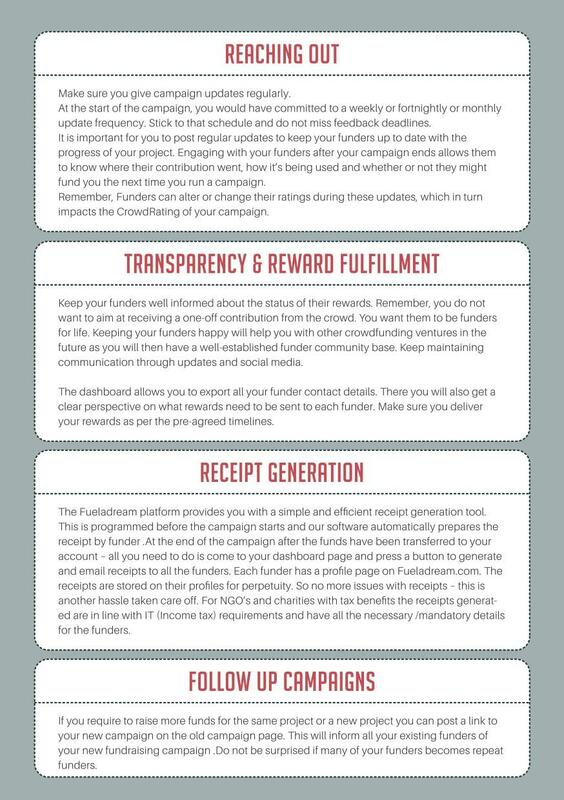 Engaging with your funders after your campaign ends allows them to know where their contribution went, how it's being used and whether or not they might fund you the next time you run a campaign on Fueladream or any crowdfunding site. Remember, Funders can alter or change their ratings during these updates, which in turn impacts the Crowd Rating of your campaign. Keep your funders well informed about the status of their rewards. Remember, you do not want to aim at receiving a one-off contribution from the crowd. You want them to be funders for life. Build a relationship with them, be it as future crowdfunding funders or in your other endeavours. Keeping your funders happy will help you with other crowdfunding ventures in the future as you will then have a well -established funder community base. Keep maintaining communication through updates and social media. The dashboard allows you to export all your funder contact details. There you will also get a clear perspective on what rewards need to be sent to each funder. Make sure you deliver your rewards as per the pre -agreed timelines. The Fueladream platform, provides you with a simple and efficient receipt generation tool. This is programmed before the campaign starts and our software automatically prepares the receipt by funder. At the end of the campaign after the funds have been transferred to your account - all you need to do is come to your dashboard page and press a button to generate and email receipts to all the funders. Each funder has a profile page on Fueladream.com. The receipts are stored on their profiles for perpetuity. So no more issues with receipts - this is another hassle taken care off. For NGO's and charities with tax benefits the receipts generated are in line with IT requirements in India and have all the necessary/ mandatory details for the Funder. If you require to raise more funds for the same project or a new project, you can post a link to your new campaign on the old campaign page. This will inform all your existing funders of your new fundraising campaign. Do not be surprised if many of your first time funders becomes repeat funders.